School building as an Antiquity? “I wish my buildings had all been made of stone,” the architect states. “Why?” was my puzzled response . And the thought did trail off as this architect reminisced over lobster on his 80th birthday. One month later Paul d’Entremont, AIA (1908-1988), award-winning architect, passed away. In the intervening years I have seen a few of his, and his firm’s (Haag & d’Entremont), buildings go under the wreaking ball, but most of them remain. 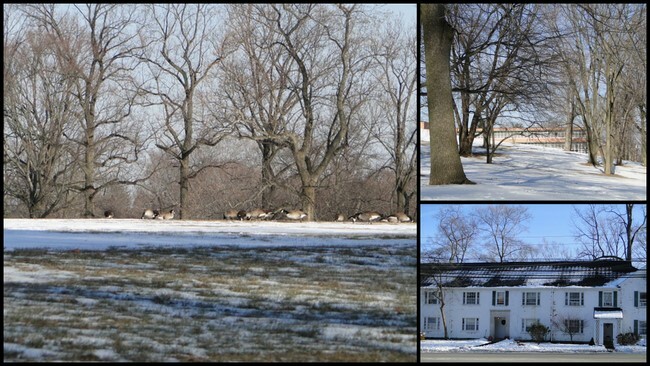 Yet much to my surprise, one mile away from my home, the Abington Township School District complex of 50 acres was declared a historic site in 1985 by the National Register of Historic Places. The four structures are suppose to span a century of municipal architecture, 1875 – 1975, but, unfortunately, due to nearsighted municipal decisions that is not true. 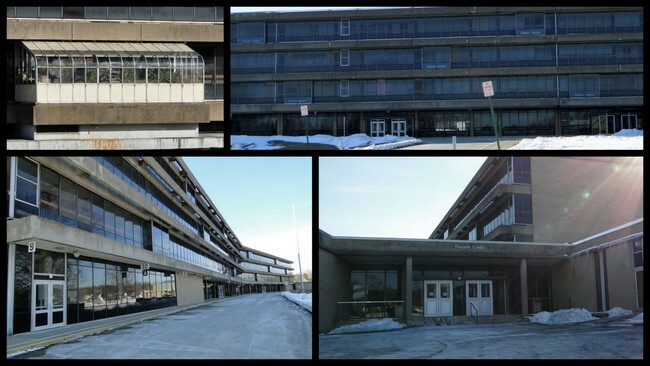 The largest of the four is the mid-century modern Abington Senior High School designed by my father and the only structure of architectural significance. True, brick does not survive the years as well as chiseled stone, but then perhaps my father didn’t realize that National Historic Register designation is a preservative in its own right (he never talked about it). After all, most of the Egyptian monuments were government built. Many of my dad’s were as well – suburban schools during the post-war boom of 1945 – 1970. Internationalism/Modernism of the 1930/1940’s was the artistic influence on my dad’s generation and his buildings expressed an exuberance in clean lines, bright open spaces and the latest technology in building materials. The National Historic designation specifically mentions the 1875 Huntingdon Junior High School, which, unfortunately, was demolished some decades prior to this designation. 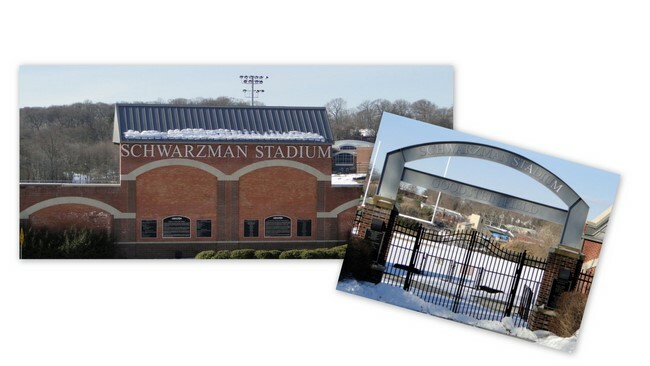 The complex today includes the 1920/1940/1970’s athletic complex, my father’s mid-century modern Senior High School and the ugly Abington Junior High School. 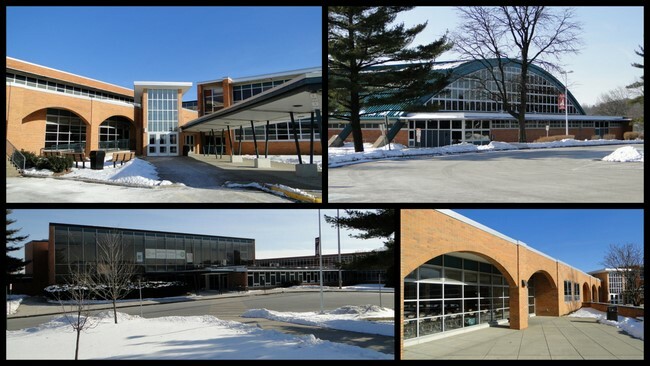 It is a 50 acre complex of educational/institutional buildings on the same site that originally included the 1875 school. Otherwise, except for Paul d’Entremont’s building, there is nothing of design significance or any visible reason why it has National Historic designation. The youngest building is the Junior High School. I was not able to locate the name of the architect or construction dates despite an extensive search on the web, but perhaps that’s best. 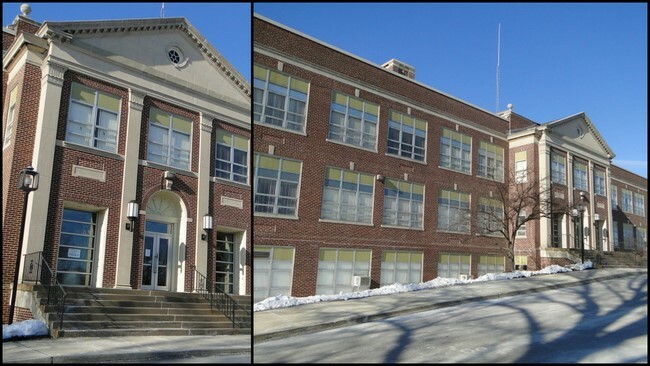 Looking at the building on a brilliantly sunny day with a blanket of white snow, the Junior High School resembled the worst in drab, gray institutional warehouse architecture. I find no pleasant lines within the structure. It’s design philosophy seems to be industrial effieiency – beginning with bus drop off. The theatre entrance resembles the trash pick-up area of most municipal structures. It’s fitting to represent this late century trend in “no-frills” architecture although I see nothing of design value. Set amidst comfortable Abington Township in Pennsylvania’s Montgomery County, this campus of four structures is certainly complimented, and softened, by the still leafy country side. My dad would be pleased. This one is especially cool.